Anterior cruciate ligament injuries commonly occur from noncontact incidences of deceleration forces combined with pivoting, cutting, and landing movements. Injuries occur during deceleration and acceleration with excessive quadriceps contraction and reduced hamstring co-contraction at or near full knee extension. Valgus stress imposed on the knee joint leading to anterior displacement of tibia creates strain on the anterior cruciate ligament. The anterior cruciate ligament is the primary restraint structure of anterior translation of the tibia to the femur and secondary restraint to internal rotation near end knee joint extension. Many intrinsic anatomical factors and extrinsic factors have been cited in research of mechanisms responsible for anterior cruciate ligament injuries as well as a greater predisposition to injury being female. The vast majority of intrinsic and extrinsic variables that may play a role make the focus on one variable difficult. Common tissue regions of anterior cruciate ligament tears are the midsubastance tear referring to the center area of the ligament and avulsions occurring at ligament bony attachment sites. Medial collateral ligament injuries commonly occur in conjunction with anterior cruciate ligament injuries on the basis of the valgus stress imposed on the knee. The vast majority of MCL injuries involve a sudden application of a valgus torque imposed on the knee joint. Mechanism of injury most commonly consists of reports of planting with awkward footing or collision with forces lateral to medial. Lateral collateral ligament injuries much less common than injuries of the anterior cruciate ligament and medial collateral. Mechanism of injury follows a varus stress to the knee along with excessive external rotation of tibia on the femur. 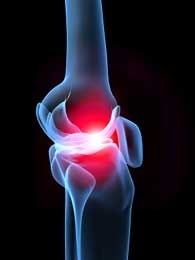 Imaging studies are commonly prescribed for differentiating knee injuries producing pain. The MRI cans are useful for diagnosing ACL injuries but limited in discrimination between complete and partial tears. MRI’s are most often ordered in regards to diagnosis of complicated or confusing cases. Clinicians may also use examination findings of knee passive/active and joint accessory motion to assess knee injuries as well as special tests. The Lachmans test and the Pivot shift test are the cited special tests in the Clinical Guidelines for Knee Sprains to rule in ACL injury. The Bulge sign and Modified stroke test are the indicated tests for collateral ligamentous injuries. The Valgus stress test if specific for MCL injuries and the Varus stress test is specific for LCL injuries. Anterior cruciate ligament injuries may have patient reports of hearing or feeling a “pop” at time of injury, a prior or post history of giving way, and hemarthrosis occurring 0-2 hours post injury. There is a loss of end range knee extension, (+) Lachmans test with nondiscrete end feel or increased tibial translation, (+) pivot shift test with a normal, abnormal, or severely abnormal shift at 10 to 20 degrees of knee flexion. The 6 meter single-limb timed hop test result that is less than 80% of uninvolved limb and maximum voluntary isometric quadriceps strength index that is less than 80% (2). Medial collateral ligament injuries may have patient report of a force applied to lateral aspect of lower extremity, pain with valgus stress test performed at 30 degrees of knee flexion, and rotational trauma. Normal knee ROM is possible but palpation of medial collateral ligament reproduces familiar pain. A (+) modified stroke test or Bulge sign is present along with increased separation present between femur and tibia with valgus stress test. Lateral collateral ligament injuries may have patient report of excessive varus trauma, pain with palpation of lateral collateral ligament and varus stress test performed between 0-30 degrees of knee flexion. Patients may display with localized effusion over the lateral collateral ligament, increased separation between tibia and femur with varus stress test, and a (+) modified stroke test or Bulge sign. The prognosis with a knee ligamentous injury is dependent upon a multitude of factors including extent of tissue damage, intervention decision, surgical success, and rehabilitation course. (1)Calmbach W, Hutchens M. Evaluation of patients presenting with knee pain: part II. Differential diagnosis. American Family Physician September 2003;68(5):917. (2) Logerstedt DS, Snyder-Mackler L, Ritter RC, Axe MJ, Godges JJ. Clinical Guidelines. Knee stability and movement coordination Impairment: Knee ligament sprains. JOSPT. 2010:40 (4). (4) Dutton, M. (2007). Orthipaedic Examination, Evaulation and Intervention. Pittsburgh: McGraw Hill.